Ari Engel is now just a single WSOPC ring away from the all-time leaders, Mark Smith and Kyle Cartwright (Cartwright won his fifth ring earlier this year), after defeating the 222 player field at the $1,125 event at the WSOPC Hammond series. The poker world has been waiting for Melanie Weisner to breakthrough with a big win on the live tournament trail for quite some time, and even though the $1k side-event at the WPT Emperors Palace Poker Classic in South Africa isn’t quite a major win, it was enough to get the monkey off her back and pick-up her first live win. Weisner defeated 133 players to win the 6-max event and pocket over $40,000. Apparently dropping out of the Top 10 on the Global Poker Index lit a fire under Vanessa Selbst who defeated a very tough final table to take down a $5k side-event at the 2012 Festa al Lago. Another winner at the Festa al Lago was 2010 Cardplayer Magazine Player of the Year Tom Marchese, who won the $2,500 NLHE event at the popular tournament series. Marchese beat a small field of just 37 players, including Doc Sands who finished in 4th place. 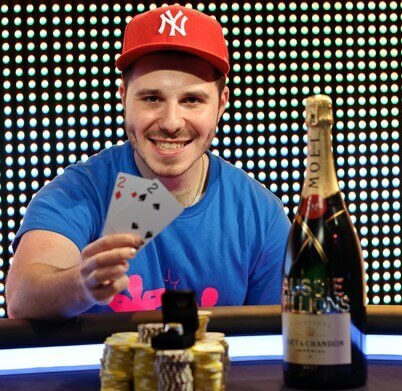 Dan Smith pulled of a rare feat this weekend, not by winning the Sunday Million, but by working an equity chop deal that saw him pocket more than first-place money! Smith won the event, bringing his total tally to $219,504.25, which was $8,000 more than the announced first-place prize-money.